I'm writing this match report on a Monday. The match took place last Friday. And taking the weekend before writing the post has made me forget some of the details, but it has also helped me put the match in perspective. - NorthWood is the #8 ranked team in NE Indiana. - NorthWood defeated us 5-0 last year, and returned their top 3 players. - NorthWood's #2S from last year MOVED DOWN to #3. 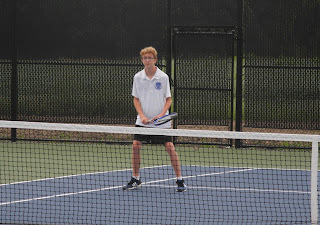 - Last year we lost 1-7 to the NorthWood JV, most of whom returned. So, by all reasonable measurements, NorthWood is a very good team. And we competed against them with confidence. We believed we could be in more matches. We were disappointed to lose points and games. We realize that this is the direction that we want to move in. We aren't there yet, but each match showed glimpses. Liam played several long games where he was in control of the points, where he was able to get to the net for big volley putaways, where he was able to find backhand passing shots. 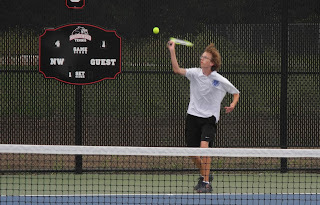 Caleb moved really well in his second set and began to find the ball he needs to compete as the match went on. Philip was in control of the first set, moving well and forcing his opponent deep into the court. Nathan and Jonah confidently attacked the net against the big hitting Panthers. Jonah even got a couple big overheads within the match. 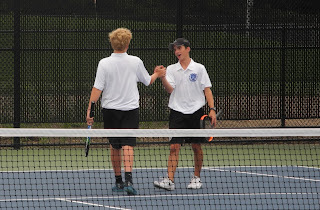 Will and Tyson weren't put off their game at all, playing a very competitive game and forcing errors from their opponents by being aggressive at the net and keeping the simple balls in the court. Yes, we have work to do to make these glimpses become our normal. But at the beginning of the season, when we took the court against Jimtown, we struggled to even see these glimpses. We are moving forward, and sometimes we forget how much work it takes. We'll come back with a focus today on doing the work. The JV match was really interesting. We played several really good doubles matches. We struggled to finish off our singles matches. Aaron, Joseph, Theo and Chris played doubles matches to be admired. Playing against some experienced Panther doubles team, they took exactly what they'd learned from practice and put it into play. Namely, they kept the ball in play and controlled the net. 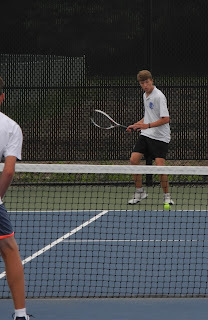 It was great to see both Chris and Aaron reign in their shots and see them landed softly cross court while they put pressure pressure on by coming to the net. Both positions went deep into the pro set. In fact, their matches both lasted longer than the majority of the varsity matches. In the end, it was the pressure they put on by attacking the net that broke through for victories. Sometimes we forget that even if we don't finish the point at the net, our presence creates pressure. It did for sure in the JV doubles. 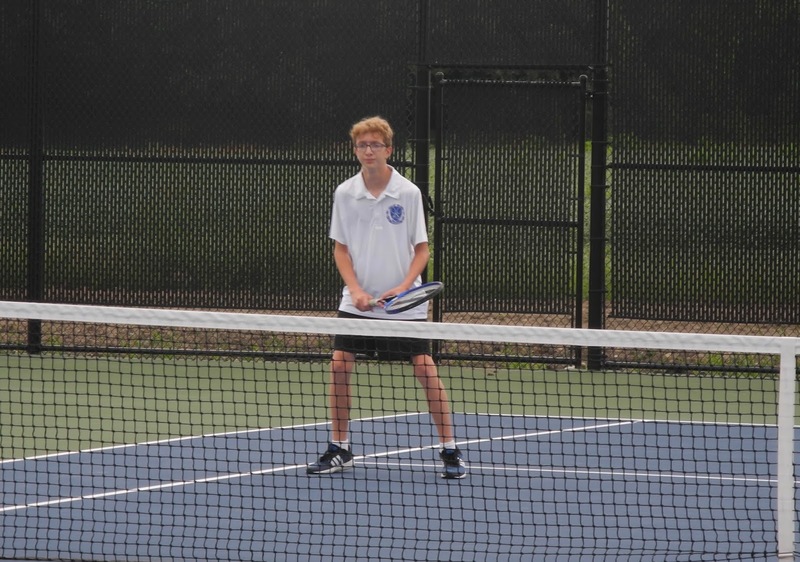 That was true in the final two JV doubles matches as well. Angel played extremely well at the net in his doubles match with Jacob Leininger, and Jacob played really well from the baseline. Unfortunately, it didn't work as well when the places were reversed. Because Angel was struggling from the baseline and Jacob at the net, the match stayed close and went to a tiebreak. 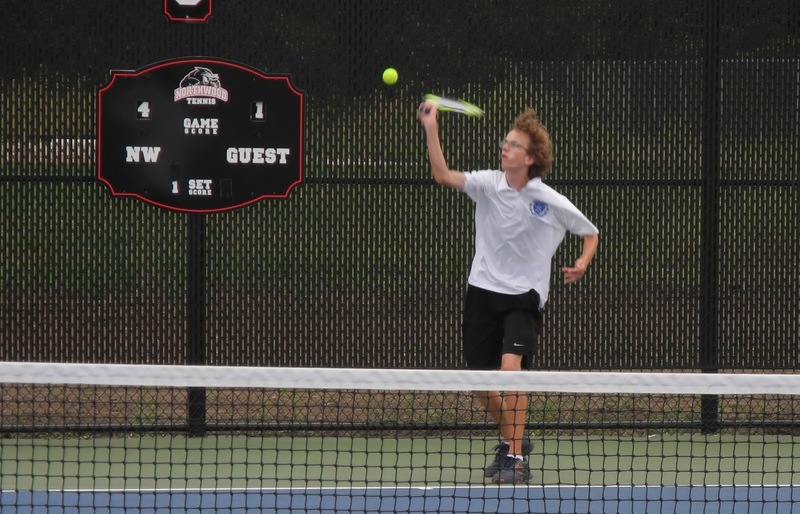 The tiebreak was close as well, but it was a few more nervous errors that swung the tide to the Panthers. Sam and Josiah continued to play well too. Consistency was the thing that was just a little off for them, and then the ability to finish points at the net. NorthWood was able to get a couple of volleys from their team. We didn't get as many. That makes a difference. In the singles matches, we played well, but couldn't find aggressive enough shots to end the point. Our singles players need to become more comfortable on the attack, and maybe that will be part of practice next time out. Attacking can mean coming to the net, hitting a strong ball to the backhand, dropping a ball in front of your opponent and then hitting a confident passing shot or lob... and we need to get better at all those things for singles. It was enough to see the glimpses. It was enough to eat Uncrustables and candy bars together. It was enough that you guys continue to care. We are entering a stretch of the season where we will have a real chance to compete in most of our remaining 9 matches, and so that continued faith is important. In fact, the only thing that matters is faith expressing itself through love. That is enough. You are brothers when you listen to each other. Tonight, I saw singles players listen to me and call Andrew and I over to the fence at many change overs. I saw doubles players listen to the encouragement from their teammates. I saw a lot of positive interaction. I saw your belief and excitement about improvement. You are brothers when you encourage each other, you are brothers when you receive that encouragement. 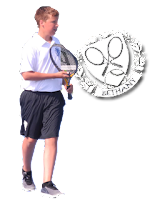 - our parents support of the program, through food, transportation, attendance at matches and so much more. - the weather turning cooler. - another chance for improvement. - another chance for encouragement. - another day with each of you. Lord, we are moving into the last part of the season. We only have two weeks of team matches left before Sectional. I can't believe how fast the season has gone. But it has been one well used by our team. Help continue to build each other up. Help us to raise our effort level as we sprint toward the finish line. Help us to smile. May You be our focus, because You are the One who gives us our worth. You are the One who gives us our identity. You are the One who gives us all that we have.